$80,000 tournament, first place paid $20K, 15 people left. 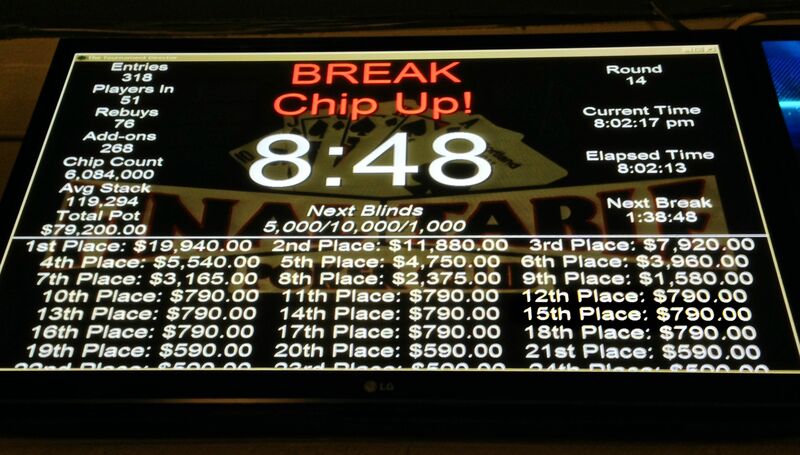 I had a healthy stack with at least a guaranteed $790 payout after I had put $225 in. With AA, I lose an 80/20 (80% chance to win) all-in after the flop to bust out right before the substantial pay bumps. Shock, denial, anger, bargaining, depression, and then acceptance. After playing solid for 10 hours, I do the long skate home, can’t help but thinking of the thousands I was practically guaranteed. Just to rub it in, the club posted on FB the picture of the guy that sucked out on me right after I busted pretty saying “look how many chips he has!!!”. The club was packed at 300 people. Hot, humid, bustling. I had reserved my spot two weeks prior for a $150 buy-in. I saw all the familiar faces of the Portland poker scene, this was the place to be. Everyone was dreaming about the $20K 1st place prize, but for most people they were already drawing dead. But I didn’t plan on it being me. I played a bit loose the first hour, making a couple of mistakes, but able to aggressively gain back chips. I had good reads on a LAG and was able to get in a couple of good squeezes and 3bets. And there was a calling station fish on my right. There was a TAG wearing Beats (by Dre) on my left but we didn’t have too much trouble with each other. Stayed at that table for 5 hours. With breaks in between, I had some Burger King and some bottled coffee from the mini-mart next door. Midway into the tournament, like Katniss, I caught fire. I was dealt QQ five times with a couple hours, getting it all in preflop everytime. They held every time to give me the chip lead with 70 people left. In the last three tables, I cooled down and showed down some second-best hands, but was able to still steal aggressively (preflop raise/cbet, resteals, button min-raises, open all-ins). I really enjoyed opening pots preflop for the min-raise late tournament. It chases bad hands out that otherwise have equity ,gets some worse hands to call, lets me fold to 3bets, all while taking initiative. Then came the biggest suckout of my life. $790 is chump change compared to what my equity was after doubling up and getting to the final table where I can really do some damage. Oh well, deal with it.